Exam results – Pupils in Gairloch High maintained a high standard of results this year in SQA exams. In Sixth year a third of the pupils achieved at least one Advanced Higher in a large range of subjects including Maths, Physics, Art, French, Biology, English, Computing and Gaelic. Many of these awards were at Grade A and show that pupils are already achieving academically at University level. This success rate continues to be one of the highest in Highland. In S5 Lyndsey Croal achieved A passes in 5 Highers. Roxanne Ramsey also gained 5 Highers. This is a difficult and commendable achievement. S4 pupils achieved very good results. All pupils achieved Maths and a third of them achieved Credit level in ALL of their exams. In the majority of cases by far, these were gained at grade 1. These results are a springboard for future success and as such the children have got off to an excellent start. These results are of a high standard when compared to other schools and we are pleased again with the efforts of pupils and staff – not forgetting parents. It is worth remembering that the important factor in this process is the individual progress of every pupil. Each year we strive to get the best out of each child in order that they are ready to move on at a level appropriate to their ability and ambition. We are discussing with each pupil what their next step should be in achieving that progress no matter what grades they achieved. Staffing – Mrs Johnston has taken up her PE post on a permanent basis this month. Ms Velt and Mrs Somers are now teaching History in addition to their own subjects. The Parent Council is still working hard to gather support for the continuation of a wide range of academic provision thus maintaining opportunities for children living in Gairloch. 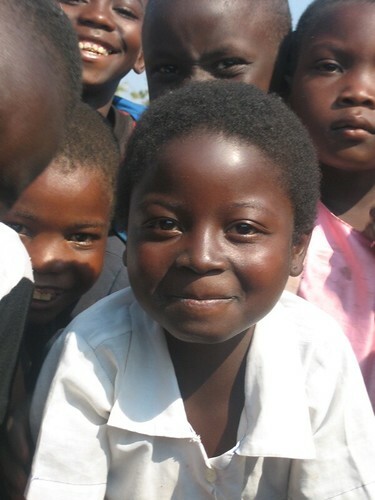 Dr Caley has returned from Malawi after a second visit to Mlozi. Click on the photo to see more. We hope to provide a report shortly. First Aid – S3 pupils were presented with their emergency first aid certificates. Their course took place in May prior to Duke of Edinburgh’s Award expeditions. We use this event to train and update staff first aid qualifications as well. This year Mrs Bulmer and Miss Colquhoun also received certificates. Project Trust – Calum Milner left for China on Thursday 27th August. We hope to be able to give updates over the year on the school website. Amy French (Head Girl) has now applied and has been offered a place next August. Amy will be fund raising over the next year with the hope of going to Thailand with Project Trust. Gaelic Writing Competition – S1/2 pupils who took part in a national competition received certificates at assembly. Mairi Wyatt came first across Scotland and was presented with her certificate and a significant cash prize at Prize-giving. Bible Project – Several pupils entered work that they completed in their Religious and Moral Education classes. They had to imagine themselves present at a major event in the life of Christ. This UK wide competition resulted in certificates of merit for Katie Allan and Mairi Wyatt while Ian Paul won a copy of the New Testament for his work which was of a ‘particularly high standard’. Living Lochs – S2 pupils went on an outdoor lesson to Loch Linne a’Mhuilinn, Mihol. They went out to collect animals and insects from the burn, bog and the loch. They studied and identified them using microscopes. The pupils were under the guidance of Lorna Brown (Wester Ross Fisheries Trust) and accompanied by Lindsey Duncan (Highland Council Countryside Ranger), David Mullaney, Robin Reid and Norman Thomas, who we would like to thank for sharing their expertise and enthusiasm. Thanks also to the Royal Society, Scottish Natural Heritage and RAFTS, who provided the funding to allow this project to take place. Click here to see some photographs of the work done. Ten more in Moray – Congratulations to Alasdair MacLennan, James Staddon, David Gorman, Mr Johnston and Mr Gorman for completing the “Ten More in Moray” endurance mountain bike race at Fochabers on Saturday 22nd August. Training over the summer paid off; the three boys were able to compete with a very fit and strong field and finished well up the rankings. They finished ten 10-mile laps in the 11 hours allowed for the event. The last lap was a nail biting affair, with Alasdair starting with no guarantee he would finish before the end of the event at 8:30PM. Fortunately, he flew round and the extra lap pushed the boys up into 13th place out of 34 male senior trios. Mr Johnston and Mr Gorman raced as a pair and did nine laps between them. To get a flavour of the event, see the video on the “No Fuss” events website. Thanks also to Mrs Gorman for catering – at 900 calories a lap, this was no mean feat! Great Wilderness Challenge – Pupils involved with the ATC helped out and took part in the event (photo). Mrs Bulmer was fastest lady over 13 miles, 11th overall and only 17mins behind the leader (photo) while Miss MacAllister walked the route.